The Mw 7.8 14 November Hanmer Springs earthquake occurred on or near the interface between the Pacific Plate and the Australian plate (Figure 1). In the North Island of New Zealand, the Pacific Plate is subducting beneath the Australian Plate along the Hikurangi subduction zone in dip-slip faulting. However, there is a transition to vertical strike-slip faulting on the Alpine fault system along the west coast of the South Island, and the Hanmer Springs earthquake occurred in that transition zone. This is reflected in the fact that the earthquake involved a combination of strike-slip faulting and dip-slip faulting. Figure 1. Left: Plate tectonic setting of New Zealand, showing relative plate motions (red arrows with rates shown in mm/yr) on the Hikurangi subduction zone and on the Alpine Fault, which form the boundary between the Pacific and Australian plates. Source: GNS Science. Top Right: Schematic cross section across Wellington showing the Wellington and Wairarapa faults in the crust above the Hikurangi subduction plate interface. Source: GNS Science. Bottom Right: Time sequence of seismic moment release of the Hanmer Springs earthquake, showing a long and complex faulting process. The epicenter of the earthquake was located about 30-45 km south-southeast of the main surface expression of the plate boundary in the region which is the Hope Fault, part of the Marlborough Fault system that connects a subduction zone (the Hikurangi Trough) to the primary plate boundary in the South Island, which is the Alpine Fault. The plate boundary in the region of the earthquake is complex, involving a transition from subduction along the Hikurangi Trough to the east of the North Island, to strike-slip faulting through the South Island. The size, depth (~25 km) and faulting orientation of the Hanmer Springs earthquake suggest the presence of a larger, subduction-related fault structure, although the subduction zone interface is not thought to extend this far to the south of the Alpine fault system. 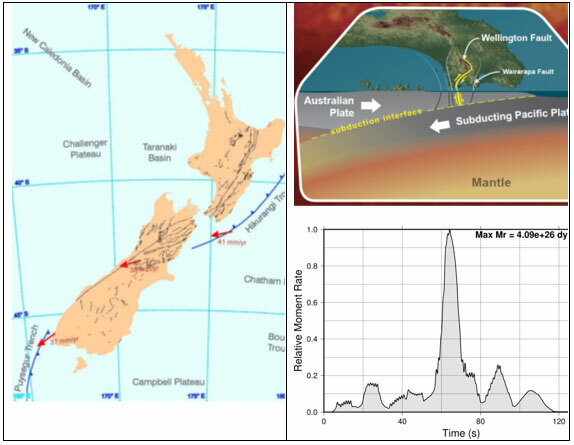 The complexity of the event, involving a main energy release delayed by about one minute, combined with an early aftershock distribution extending about 150 km to the northeast of the mainshock, suggests the potential for triggered slip on the Hikurangi subduction zone. The right side of Figure 2 shows a preliminary rupture model of the earthquake assuming a single fault plane. Rupture began near Hanmer Springs and propagated to the northeast east to Wellington, with the largest slip occurring in the Marlborough Region south of Blenheim. This forward rupture directivity and the possible occurrence of earthquake rupture beneath Wellington itself may have been partly responsible for the considerable damage that occurred in Wellington. However, the complexity of the earthquake rupture process is indicated by the multiple episodes of seismic moment release at the bottom right of Figure 1. This diagram suggests that the earthquake may have consisted of perhaps six events, which may have occurred on different faults. This would be consistent with the presence of many mapped faults in the region, shown on the left side of Figure 2. Figure 2. Left: Mapped faults in central New Zealand. Source: GNS Science. Right: Slip map of the Hanmer Springs earthquake. The red line is the surface projection of the top of the fault, and lies offshore. The epicentre (right) is located at the southwest end of the fault, where very little slip occurred. Rupture propagated to the northeast to Wellington, with the largest slip occurring in the Marlborough Region south of Blenheim. Source: USGS. We defer detailed discussion of impacts to future briefings. Peak ground accelerations (PGAs) have been recorded up to 0.23g in Wellington, comparable to those recorded in the 2013 Lake Grassmere and Cook Strait earthquakes, and may have caused considerable damage. Initially no tsunami warning was issued, presumably because the epicentre was onshore, but later a tsunami warning was issued, and waves up to several metres height impacted the coastline between Christchurch and Wellington. The GPS station at Cape Campbell in Marlborough moved two metres north. The main impacts that we have seen to date involve damage to port facilities in Wellington and Picton with evidence of soil liquefaction; slumping of road embankments; and landslides and rockfalls hindering access to Kaikoura and other towns. Sections of the railway have buckled or moved, and some are covered in slips. The rail line between Picton and Christchurch is closed, and is likely to remain closed for some days. The state highway between Blenheim and Christchurch is also closed. There are other road closures in the region. There are concerns about potential flooding in north Canterbury and Kaikoura as rivers have been blocked by landslides. There have been widespread phone and power outages in both the North and South Islands. Central New Zealand experienced a number of small to moderate sized earthquakes in 2013 (Figure 3). These include the M 6.5 Cook Strait earthquake of July 21, 2013 (see Risk Frontiers Briefing 257), which occurred approximately 40 km northeast of the M 6.5 (USGS) August 16, 2013 Lake Grassmere earthquake, which occurred south of Blenheim (see Risk Frontiers Briefing 260). The August 16 earthquake occurred on land, near the eastern end of the complex Marlborough Fault System. The event is located approximately 10 km southeast of the Awatere Fault in the vicinity of Lake Grassmere. The Marlborough Fault system contains a series of NE striking right-lateral strike slip faults that have broken the northern South Island into a series of crustal blocks that are moving to the northeast. Although no specific mapped surface fault has been linked to the August 16 event, the NE trending fault plane has an orientation that is similar to those of the Awatere (no. 357 in Figure 2) and Clarence (no. 388 in Figure 2) faults of the Marlborough system. In 1966 a M 5.8 earthquake, thought to have occurred offshore to the NE of the August 16 event, was widely felt in this area, causing surface deformation of the main railway line in the region. That event is interpreted to have occurred on a blind structure sub-parallel to and southeast of the Awatere fault. It is not clear how the faults that ruptured in the Hanmer Springs earthquake relate to the Hikurangi subduction zone. However, if these are separate structures, then the occurrence of the Hanmer Springs earthquake may suggest the potential for triggered slip on the Hikurangi subduction zone (Figure 1). The time of occurrence of the most recent large earthquake on the southern part of the Hikurangu subduction zone is not known. The recurrence interval of magnitude Mw 8.4 earthquakes on this zone is estimated by GNS Science to be approximately 1,000 years. According to GNS Science, the most recent large earthquake on the Wellington fault (Figure 1, top right) occurred approximately 300 years ago, and such events are estimated to have a recurrence interval in the range of 800 – 1,000 years. 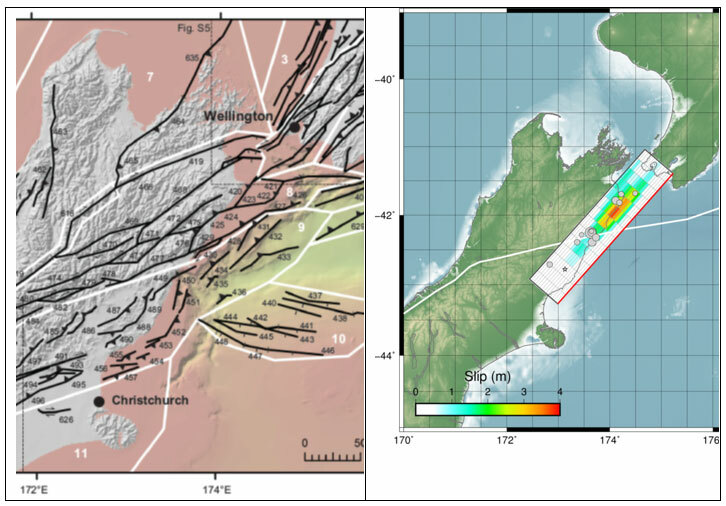 Furthermore, the Mw 8.2 earthquake that occurred in 1855 on the Wairarapa fault (Figure 1, top right), which lies east of and parallel to the Wellington fault, is thought to have reduced the stress on the Wellington fault. This would suggest that a large earthquake on the Wellington fault is not imminent; this probability is estimated to be 10% in 100 years by GNS Science. However, the 1855 Wairarapa earthquake was preceded by a Mw 7.5 earthquake on the Marlborough fault system in 1848, suggesting the possibility that seismic activity in the Marlborough region may again be a precursor to a large earthquake in the Wellington region. Compared with their estimate of recurrence of a large earthquake on the Wellington fault, GNS Science estimates a much higher probability of a large earthquake on the Alpine fault. The last large event on the Alpine fault occurred 296 years ago, and large earthquakes on it are estimated to have a recurrence interval of 330 years. GNS Science estimates a 30% probability of a large earthquake on the Alpine fault in the next 50 years. Acknowledgment. This briefing uses information from the GNS Science and US Geological Survey websites and publications.